The gumdrop-shaped capsule, blackened by the heat of a high-speed re-entry, splashed down in the Pacific Ocean about 560 miles west of Baja California at 11:42 a.m. EDT (1542 GMT). A fleet of recovery vessels, staffed with SpaceX engineers and divers, retrieved the capsule from the sea and set course for the California coast. "This couldn't have gone any better," said Elon Musk, SpaceX's CEO and chief designer. "I'm just overwhelmed with joy." The Dragon spacecraft became the first privately-owned vehicle to fly to the International Space Station, notching that triumph May 25 at the end of a cautious laser-guided approach to the complex. The capsule also became the first U.S. spacecraft to reach the space station since the last space shuttle flight departed in July 2011. 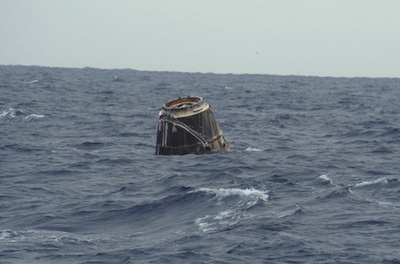 With Thursday's splashdown, Dragon proved it could fill a void left after the shuttle's retirement in returning experiment samples, broken components and other excess hardware to Earth. "In baseball terminology, this would be a grand slam," Musk said. "This was a bigger success than we had a reasonable right to expect." SpaceX is due to begin regular cargo flights to the space station as soon as September, and Dragon will be the only craft on the lab's roster of servicing vehicles able to return significant hardware to Earth. The Dragon test flight launched from Florida on May 22 aboard a Falcon 9 rocket. Three days later, after a flyby to demonstrate rendezvous techniques, the spacecraft precisely flew within 30 feet of the space station, close enough for the crew inside the complex to grapple Dragon with a robotic arm. The astronauts unloaded more than 1,000 pounds of cargo from Dragon's pressurized compartment, including food, clothing, student experiments, and computer gear. The crew installed more than 1,300 pounds of equipment back inside Dragon for return to Earth. After six days attached to the complex, Dragon was released from the lab's robotic arm at 5:35 a.m. EDT (0935 GMT). SpaceX flight controllers at the company's headquarters in Hawthorne, Calif., commanded the ship's thrusters to five for nearly 10 minutes a few hours later. The thrust slowed Dragon's speed by more than 200 mph, enough for its orbit to drop into the atmosphere for re-entry. Dragon's blunt end was shielded by a capable carbon material called PICA-X, deflecting temperatures of up to 3,000 degrees Fahrenheit as the spacecraft plunged back to Earth at 25 times the speed of sound. Chase planes circling the landing zone caught a glimpse of Dragon with infrared cameras, confirming the craft's parachutes unfurled to slow the spacecraft to a gentle velocity of about 11 mph. Although image quality from the chase planes was poor, the intermittent video appeared to show Dragon bobbing in the water shortly after splashdown. SpaceX later released a photograph of the spacecraft in the Pacific Ocean, appearing charred but in good shape. The successful conclusion of the test flight capped a triumphant mission for SpaceX, which intends to outfit the Dragon spacecraft for crewed launches and landings within three or four years. SpaceX is competing for funding from NASA to finance the effort. "It really shows that commercial spaceflight can be successful," Musk said of the mission. "This mission worked the first time right out of the gate. All phases of the mission were successful." The flight was the culmination of a six-year, $396 million Commercial Orbital Transportation Services, or COTS, agreement between SpaceX and NASA, in which the government provided investment into the company's development of the Falcon 9 booster and Dragon spacecraft. NASA delivered funding payments as SpaceX met milestones in design and testing, and the space agency will deliver the final installment of money upon the successful retrieval of space station cargo from Dragon's cabin. The COTS program aimed to help industry provide commercial cargo transportation systems for the space station after the shuttle's retirement. When the shuttle retirement decision was made, there were no companies positioned to offer such services. "We became your customer today," Alan Lindenmoyer, NASA's commercial crew and cargo program manager, told Musk after splashdown. "I believe we're very close to having you provide cargo resupply services to the station on a regular basis." Formal reviews in June should clear the way for SpaceX's first operational cargo mission in September, Lindenmoyer said. NASA's other partner in the COTS program is Orbital Sciences Corp., which is scheduled to conduct a similar test flight to the space station by the end of 2012. SpaceX and Orbital Sciences have contracts for operational resupply missions to the space station following their COTS demonstration flights. SpaceX's $1.6 billion contract covers 12 missions through 2015, while Orbital is signed up for eight flights for $1.9 billion in the same time period.